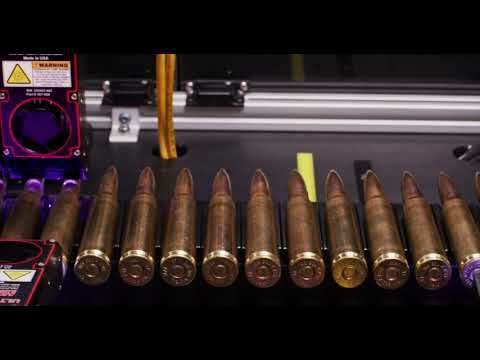 The Autosealer® 5250 is an ammunition sealing system for large caliber cartridges. Capable of sealing up to 60 parts per minute, this machine can handle .50 caliber rounds and larger. All optional ammunition sealing enhancements are available for this machine including Bowl Feeders, tooling for multiple caliber sizes, Zig-Zag cartridge hoppers, machine vision inspection and LCD HMI. Sealants are dispensed from a non-contact jet dispensing valve and wick into position on both the cartridge case mouth and primer for a complete, penetrating seal against water and other contaminants. Can seal .50 caliber cartridges and up. Built in safety features to protect against live ammunition. Utilizes Hernon’s Sureshot® 3500 microjet dispensing technology. Utilizes Hernon’s Ultracure® 9 UV LED curing light. Customized pass/fail settings via proprietary software and color, touch-screen HMI.